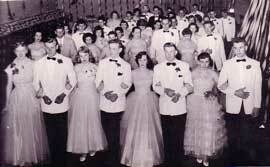 Students from the 1950s gather at a high school prom. Photo Courtesy of Kevin Delaney, Wayland High School, Massachusetts. For many high school students, the spring prom is one of the social highlights of the school year. High schools began holding proms the early part of the 20th century as a way to teach students about formal social behavior. The prom served as a place for students to dress up in their best clothes and to test out the social skills they learned. Proms took place at the school, usually in the gym, under the watchful eye of teachers and other chaperones. By the end of the century, proms had evolved into school functions largely organized by students. Proms are often held in hotel ballrooms or country clubs. Proms still involve dinning and dancing, but the scale has greatly increased. Traditionally, boys ask girls to the prom. Sometimes this involves anxiety for both boys and girls: Will he ask me? Will she say yes? To get to the dance, students usually drive to the prom or a few couples may rent a limousine. At the dance, students vote for prom king and queen and other couples who will serve as the king and queen’s attendants. Usually the most popular students are elected, though their role is only symbolic.